Shaw and a group of students from the University of Wyoming identified the new wasp species during recent expeditions to northern Ecuador’s Yanayacu Biological Station. Found worldwide, wasps in the genus Aleiodes are obligate parasites, meaning they rely on another species to complete their life cycle. 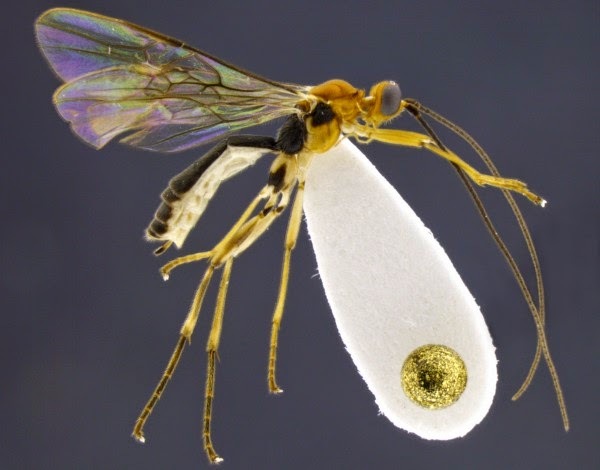 Once a female Aleiodes wasp finds a caterpillar host, she injects an egg into its body. At first, the caterpillar doesn’t even seem to notice. As the egg develops into a larva, however, it consumes the caterpillar from the inside out, making it shrink and become discolored. Further development inside the caterpillar hardens its surface and causes it to shrivel, creating the mummy-like appearance. The larvae pupates inside the husk of its host, eventually cutting a hole in the back of the mummy, from which it emerges as an adult wasp. The whole process takes several months from the initial injection of the egg to the final emergence of the adult.